The Derbyshire based division of Tex Plastics recently installed a large 80-55 Engin Plast central granulation system. 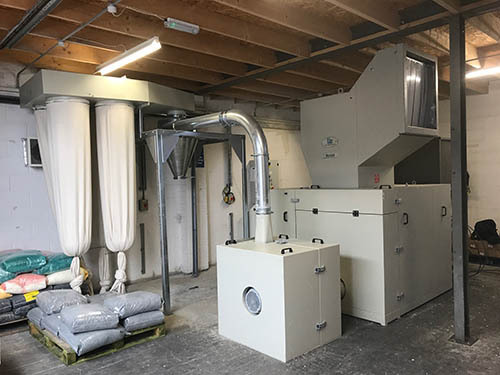 The installation, which also included a big bag loading system, and soundproofing enclosures for both the granulator and the blower, was supplied and installed by Renmar Plastics Machinery. The equipment will facilitate the in-house reprocessing of larger scrap components. “Our priority was to recycle larger plastic components within a dedicated part of our factory, particularly as our high tonnage injection moulding machine portfolio has increased in recent years. These components were traditionally sold on to a third party”. “Having spoken to several companies that supply larger models of material granulators, Renmar were particularly proactive in assessing our requirements. They took samples of our larger mouldings away for evaluation and testing, before quoting for a suitable unit”. The evaluation involved the use of a modelling system that simulated the passage of the 14 products supplied by Tex through the cutting chamber throat. This ensured that all mouldings would pass cleanly through the system, regardless of angle of presentation. It was established that a smaller 60-40 model would require around 60% of mouldings to be pre-cut with a band saw. The additional cost of the selected 80-55 model was therefore easily justified. Tex have subsequently ordered multiple press side granulators from Renmar to process smaller item such as cold runner systems on a ‘closed loop’ basis. These smaller 22-18 units still utilise quiet rotor technology, a compressed air bearing protection system, and offer throughputs of up to 60 kilos per hour. The main installation came with impressive standard features such as compressed air cleaning for the bearing housing. This system counters the typical issue of fine plastic filaments wrapping around the main shaft and being forced into the bearing housings. A periodic blast of air removes contaminants, which are then isolated in a collection chamber. Engin Plast units are also readily upgraded. They can for example, be pre-prepared for the addition of a cooling jacket around the cutting chamber, making them ideal for reprocessing hot components. Build quality is also a strong point. The cutting chamber is constructed from 25mm thick plate, which is bolted together rather than permanently welded. This provides improved access and allows components rather than a complete assembly to be switched out.